Dear Lord. Pony Boy, you are the gift that keeps on giving, aren’t you? First you provided everyone in the Valley with years of entertainment as you steered a once-great publicly traded company into the weeds. Changing the ticker symbol to JAVA. Open-sourcing everything you could lay your hands on. And now this. 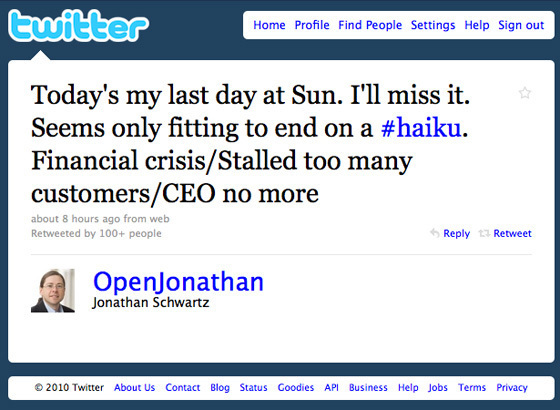 A resignation, in haiku, over Twitter. Does it get any better? Can it possibly? The answer is, yes it can. Because now Jonathan Schwartz has sparked a new meme in the Valley — tribute haikus.